" I like the fact the journal reviews the article in small time and the reviewers are quite knowledgeable and provide a good critic of the paper. However, the quality of the papers can be improved but I am sure the journal is working towards accepting only good quality manuscripts." Deepti Dabas, PhD Kalsec Inc.
Food security features as one of the dynamic and complex challenge that the humanity ever faced in its history. Before talking about inter-relationship between food security and food sciences, it would be worthwhile to review the most accepted definitions of both terms. According to the Food and Agriculture Organization (FAO): ‘Food Security’ exists when all people, at all times, have physical and economic access to sufficient, safe and nutritious food to meet their dietary needs and food preferences for an active and healthy life. According to the Institute of Food Technologists (IFT): ‘Food Science’ is the discipline in which biology, physical sciences, and engineering are used to study the nature of foods, the causes of their deterioration, and the principles underlying food processing. 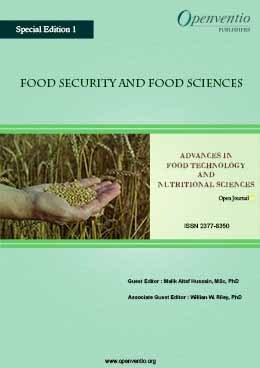 Analysis of the nature of global food security challenge reveals that it is associated with several other issues; increasing world population, changing diet patterns, falling water tables, growing number of hungry individuals, deteriorating agriculture soils, decreasing agriculture yields, climate change, and running short of time. Yes, we are just over seven billion now and will be nine billion by 2050 on the same size planet – the earth. In other words, the world population clock is ticking continuously and every second passed adding to our total number dwelling on the earth. Therefore, complexity of this challenge demands urgent measures rather to assume that the food crisis situation will develop after couple of decades in 2030 or 2050. A single event that may create large scale emergency such as poor harvest in a vast region, drought or famine would be enough to disrupt the world food supply, thus could force thousands of families to go hungry and end up with life threatening situation, i.e., severe malnutrition or even death. A time when world is heading toward potential shortage of food for human consumption, the news about possibilities to increase productivity and yields is grim. Agricultural productivity is vulnerable and poor crop and livestock yields are predicted due to several factors – climate change is one of the major one. Many reports have pointed out that climate change will alter the stability of food supplies and create new food security challenges as the world seeks to feed nine billion people by 2050. The solution of food security challenge requires world to ensure supply of sufficient, safe and nutritious food to everyone on our planet. This is not a simple task and multiple sectors – science and education, research and development, social, political and regulatory changes need to move forward in a systematic and synchronised manner. Food science as a discipline has a lot to offer by maintaining the stability of food supply. A better understanding of the nature of changes in food with climate change could inform us more appropriate processing technologies. Therefore, food science and allied disciplines have a role to play in food process innovation, food safety and quality improvement and an efficient supply chain development. This will ultimately contribute to the availability of more and safe foods for a longer time period. One example how food science will be able to improve food security is removing the food allergens through food processing. This could put more food on table for people with specific conditions such as lactose or gluten intolerant. Another example where food science seems a major contributor is reducing the food wastage through improvement in food safety and quality as well as improved utilization. According to the United Nations, approximately 1.3 billion tons of food (about a third of the world’s food supply) was wasted in 2013. A reduction in this wastage will help to decrease the number of hungry individuals – currently 1.2 billion people are facing hunger and extreme poverty. 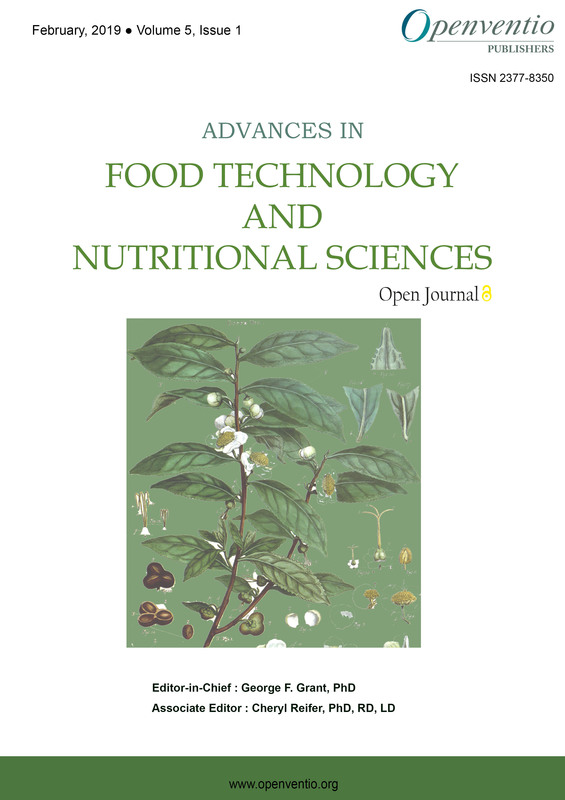 This special edition of Advances in Food Technology and Nutritional Sciences – Open Journal on “Food Security and Food Sciences” aims to highlight the food security challenge from a different angle and look at the possible ways offered by food sciences to address the issues impacting it. I also plan to contribute an article on ‘Food Product Innovation and Safety: Vital Elements of the Global Food Security’. We know there are many approaches that are suggesting the remedies of the potential food crisis situations at the moment. These approaches include: addressing global warming, droughts and climate change; increasing food productions; reduction in the world population growth; modernizing governmental policies; managing the fluctuation in food markets; and so on. Food science is a key player in new developing approach, which emphasizes to improve food systems and utilization through food product innovation, better food supply chain, preservation and storage as well as effective food safety management. I am optimistic about opportunity this special edition brings to us for presenting our position in tackling this global issue as food science professionals. The Food Industry and Nutritional Health: In Concert or in Conflict? Introduction: Increasing rates of obesity, diabetes and associated chronic diseases requires implementing a new method of integration for healthy longevity. We have elaborated to take the balance of food, physical activity and mind to achieve a healthy spiritual life by stimulating the self-healing capacity. Objectives: All 161 registered participants to ARSOA Wellness Fasting from October, 2014 to December 2015 were analyzed. Methods: About 20-25 participants each time stayed in a mountainous hotel, and received a combination of low-energy vegetarian diet (about 300 kcal intake by fermented vegetable juice per day), physical exercise (2-hour walking, slow training and stretch), meditation, and lectures about healthy life habits in the 4-day program. Facilities, such as foot spar, radon bath, and massage with/without oil were available in free time. Results: Body weight decreased about 2 kg, and fat percent and muscle volume also decreased during 4 day fasting. Although headache, hungry, gastrointestinal (GI) tract distress, emesis, depressive and cold feeling occurred toward the 2nd day, these symptoms disappeared at the 4th day, and active and vivid feeling increased on the 4th day and after. Skin condition also became good by fasting. Symptoms, mood and body changes interacted and became better later. Conclusion: Using this regimen, a new practical method of fasting for healthy longevity could be established. Aim: This study investigates the prevalence of Listeria spp. in fresh produce sold in the Canterbury region of New Zealand. Background: L. monocytogenes is a common pathogenic bacterium that can be present and grow on fresh produce. Therefore, systematic risk assessment is needed to avoid a food safety scare. Results: Microbiological analysis to detect Listeria spp. in fresh produce samples showed that lettuce from the retail shops had the highest level (4.2 log cfu/g) >cucumber (3.2 log cfu/g) >cabbage (2.5 log cfu/g) >carrot (nil). In terms of Listeria prevalence, carrot samples had the lowest Listeria spp. load (<1.05 log cfu/g) and lettuce samples had the highest (>4 log cfu/g). None of the samples showed a positive result for L. monocytogenes presence. Conclusion: Although the L. monocytogenes was not detected in this study, the potential hazard for contaminating fresh produce by this organism still exist due to high prevalence of Listeria spp. Diagnosing and treating additional health problems in autistic children or adults, beyond their own autism troubles, is always a challenge under first of parent responsibility. This paper reports on the success of nutrition-based therapeutic approaches for improving the health and solving digestive troubles of a communicating-impaired and initially overweight patient. Symptoms include frequent burping, and diagnoses revealed hiatal hernia and stomach ulcers. Two different diet plans have been successively applied over one year. Each half-year diet impact has been home-monitored by measuring the body-mass data and index. Details on nutrition, supplement and drug intakes, as well as any observations were daily recorded. The first halfyear diet was based on gastroesophageal reflux preventing recommendations, whereas the 2nd diet plan was elaborated from the metabolic typing and gluten intolerance information. Normal body mass index (BMI) values (20-25) were reached during the 1st phase, which was marked by an increase in the intake of food supplement and a reduction in the frequency of drug intakes, especially from the 4th month. After one-year of nutrition-based therapy, the patient health has been generally improved, and the hiatal hernia and ulcer problems have disappeared. A database containing all information recorded throughout the diet plans was created. During the patient body-mass loss, the muscle part increased whereas the fat part dropped. Such fat mass loss observed over the 1st 4 months was possibly correlated to the intake frequency diminution of proton pump inhibitor, acting against the gastric acid secretion. During last 6-months of strict nutrition therapy, the body mass remained stable. Consumers of products preferably demand minimally processed products that do not contain chemical preservatives and maintain health benefits. These encourage the use of dietary fiber (DF) to combat some metabolic disorders like diabetes and other immunological compromisings. This study indicates the potential of DF to satisfy the lowering of estimated glycemic index from improved white bread. The sources were selected from crude fiber composition of different cereals and fruits. Fruits of ripen avocado mesocarps and baobab pulps composed of total pectin composition 13%, 30% respectively and selected as good sources. Analysis of total dietary fiber (TDF), insoluble dietary fiber (IDF) and soluble dietary fiber (SDF) were carried out according to the manufacturer megazyme total dietary fiber kit protocol and methods described in Association of Official Analytical Chemists (AOAC). Improvement of DF was observed by enhancing on white breads (WB) based on the daily requirement of soluble fibers (pectin) composition, i.e. 6 g/day. Samples of avocado improved bread (AVB) and baobab improved bread (ADB) were made by mixing in proportion of wheat flour to avocado/baobab pulps (97:3); (94:6); (88:12). Analysis of proximate composition and in vitro estimation of hydrolysis index (HI) and glycemic index (GI) were done for products to evaluate the quality and impact on blood glucose level. Significant differences were observed for predicted GI between improved bread and controls, 82.84±0.37 (WB), 80.63±0.21 (ADB), 78.50±0.30 (AVB). As a result, the reductions in GI for the improved white breads indicate the delay in release of glucose from absorption by the cell due to the viscous nature of dietary fiber component. Thus, the improved white breads with appropriate soluble dietary fiber (pectin) content, reveals the potential for the reduction of blood glucose level and can be considered as functional foods (nutraceuticals) along with its moderate level degree of likeness or sensory acceptability. In general, the study has indicated that the soluble fibres can have a potential to reduce the postprandial glucose by delaying absorption in cells. It is widely known that athletes used to rely on training and good nutrition to provide maximum results. But now to maintain a competitive edge, athletes are switching to nutraceuticals. They are dietary supplements that provide health benefits. Nutraceuticals and dietary supplements are now commonly used to enhance and improve the health and performance of athletes. This has triggered the sale of nutraceuticals in the market and stores and gyms are selling hundreds of different supplements. These nutritional supplements usually claim to improve strength, performance and stamina, help build lean muscle, and help to burn excess fat. There are many health and nutritional supplements available in the market for the athletes. It is a difficult choice to choose the suitable and appropriate nutraceutical for oneself. The present article will introduce the athlete to a variety of different nutritional health supplements available in the market including fat burners, conjugated linoleic acid (CLA), numerous essential fatty acids (EFAs), creatine, whey proteins, glutamine, Tribulusterrestris, beta-hydroxy beta-methylbutyrate (HMB), methoxyIsoflavone, and Cordyceps. Aim: Pesticide residue dissipation in chickpea legume under simulated storage conditions as well as effect of processing techniques was investigated. Further, the impact of pesticide residues was studied on micronutrient bioavailability. Background: Food quality and safety have assumed an important dimension in current scenario. It is important to investigate the pesticide residues present in the grains from storage in warehouses and their dissipation through processing. Methods: Pesticide residues in chickpea grains were analyzed through gas chromatography (GC) while simulated gastric digestion was undertaken for bioavailability. Results: The dissipation pattern of chlorpyrifos and its metabolites under grain storage conditions for 5 months revealed that the residues exceeded the maximum residue limit (MRL) values right from the beginning of the storage. The effect of processing techniques showed that soaking and germination eliminated almost all the pesticide residues. However, the build-up of toxic metabolite oxon during pressure cooking and microwave (MW) cooking is a matter of great concern because of its greater toxicity than parent pesticide molecule. The impact of pesticide residues on the bioavailability of micronutrients showed that chlorpyrifos did not impact the bioavailability of Fe and Zn but significantly reduced the bioavailability of Cu and Mn at the highest spiking level (25 ppm) of chlorpyrifos. Conclusion: Storage of grains leads to accumulation of residues which are eliminated by household processing techniques. Pesticide residues impact micronutrient bioavailability in grains. In many countries, rice contributes to health by supplying dietary energy, proteins and fat. Many different species of rice have been developed in Japan and other rice producing countries. Some varieties are expected to prevent various diseases, or to be used for dietary therapy. The health effects of brown rice are empirically well known, and accumulating evidence about the physiological and pharmacological activity of rice bran strongly supports the use of brown rice in the dietary therapy. These could be categorized in the new concept, “medical rice”. For example: medical rice for diabetes (glycemic index<55), medical rice for chronic kidney disease (CKD) (protein<1/20), medical rice for mental health (high gamma-aminobutylic acid or γ-aminobutylic acid (GABA), gamma oryzanol (γ-oryzanol) and/or ferulic acid), and medical rice for cancer prevention (high antioxidant capacity). Organic cultivation is necessary to avoid toxic substances from fertilizers and insecticides. In response to the enormous increase of medical costs in many countries, encouragement of healthy longevity by changes of dietary habits is mandatory. Functional food labeling has started in 2015 in Japan, so the proper food labeling of medical rice could help people who want to control and/or improve their health status. Crambe grains are a new feed with high concentrations of proteins and fibers. As there is no control during the pre-harvesting or post-harvesting stages of production other grains, crambe may be contaminated by fungi. Fungal overgrowth may lead to mycotoxins production and nutritional properties decrease of the grains. The aim of this study was to analyze the occurrence of fungi and mycotoxins according to pre-harvesting management. Fungal concentration was higher than that recommended by international regulations (3.4×106 to 1.3×104 CFU.g-1), suggesting that management in pre-harvesting stages of crambe grains production may expose the animals that will feed on these grains to the risk of contamination by fungal toxins. More studies are required about quality of crambe grains, because may be strongly affected by the exposition to variable environmental conditions. But, considering low mycotoxin incidence and levels founded, the crambe proves to be a safe food to be exploited for animal nutrition. Phytoestrogens are a diverse group of plant-derived compounds that structurally or functionally mimic mammalian estrogens and show potential benefits for human health. They can serve as potential alternatives to the synthetic selective estrogen receptor modulators which are currently being used in hormone replacement therapy. Estrogens play many important physiological roles in men and women. In women, life is severely affected by a variety of estrogen-related conditions such as osteoporosis, cognitive and cardiovascular disease, increased risk of breast cancer and other symptoms that decrease the overall quality of life. Phytoestrogens are effective in maintaining bone mineral density, prevent bone loss, and help in the prevention and/or treatment of such health related problems. They can be classified as flavonoids, isoflavonoids, coumestans, stilbenes, lignans and terpenoids. The main isoflavones, genistein and daidzein found in soybean, can exist as glucosides or as aglycones, and are readily hydrolyzed in the gut to their aglycones. The aglycones are easily transported across intestinal epithelial cells. Terpenoids (ferutinine, tschimgine, and tschimganidine) found in the Umbelliferae family have estrogenic activities. The main dietary source of phytoestrogenic stilbenes is trans-resveratrol from red wine and peanuts. Plant-derived foods may be an adequate source for a variety of phytoestrogens capable of producing a range of pharmacological effects and protection from various life threatening diseases. This article provides the comprehensive information about the main groups of phytoestrogens, their food as well as herbal or botanical sources, potential health benefits and probable health hazards. Background: The aim of this study was to investigate the effects of fermentation with Lactobacillus plantarum strain 6710, on protein- and pro-vitamin A-fortified and wild type cassava flours for production of cooked fufu. Results: Physico-chemical analysis of fufu flour and cooked fufu were accomplished. Pasting properties determined that non-inoculated zeolin fortified cassava flour at 0 h of fermentation will cook rapidly due to its low pasting temperature. Volatiles such as acetic acid, hexanal, nonanal and decanal were detected in most samples. A trained sensory panel determined no impact of sample type on cooked fufu aroma. The present study was carried out to investigate the effect of different drying methods on the physicochemical composition and organoleptic characteristics of dehydrated apricot fruits. The fresh apricot was dehydrated in open sun and in moveable solar drier developed by Pakistan Council of Scientific and Industrial Research (PCSIR) Skardu. The chemical composition showed that the fresh apricots contained moisture 83.3%, ash 0.72%, crude fat 0.03%, crude Protein 0.9%, crude fiber 1.02% and carbohydrates 14.03%. The moveable solar drier and using open sun drying substantially decreased moisture content to 14.61% and 15.7% respectively. Proportions of other components were increased, which include ash (3.51% and 3.43%), crude fat (1.99% and 1.82%), crude protein (1.0% and 0.97%), crude fiber (2.98% and 2.95%) and carbohydrates (75.91% and 75.13%). Organoleptic characteristics of open sun dried apricot has a little negative effect on over all acceptability when compared to moveable solar dehydrated apricot, however the open sun dried method was declared acceptable by the panel of judges for color, taste and overall acceptability. For many years, both preclinical and clinical studies have provided evidences to support the beneficial effects of ω-3 Polyunsaturated fatty acids (PUFAs), particularly Eicosapentaenoic acid (EPA) and Docosahexaenoic acid (DHA) in the prevention of chronic diseases. However, recently, an increasing number of studies reported adverse or contradictory effects of ω-3 PUFAs on human health. While dose and experimental condition need to be considered when evaluating these effects, oxidation of PUFAs also serves as an important factor contributing to the inconsistent results. In fact, oxidation of PUFAs happens frequently during food processing and storage, cooking and even after food ingestion. 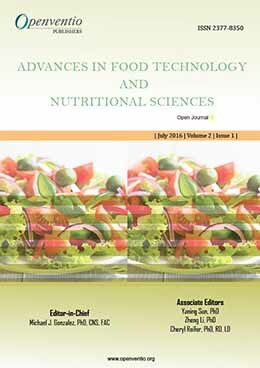 The free radicals and metabolites generated from PUFA oxidation may adversely affect food quality and shelf life by producing off-flavors and reducing nutritional values. The impact of PUFA oxidation in human health is more complicated, depending on the concentration of products, disease background and targets. 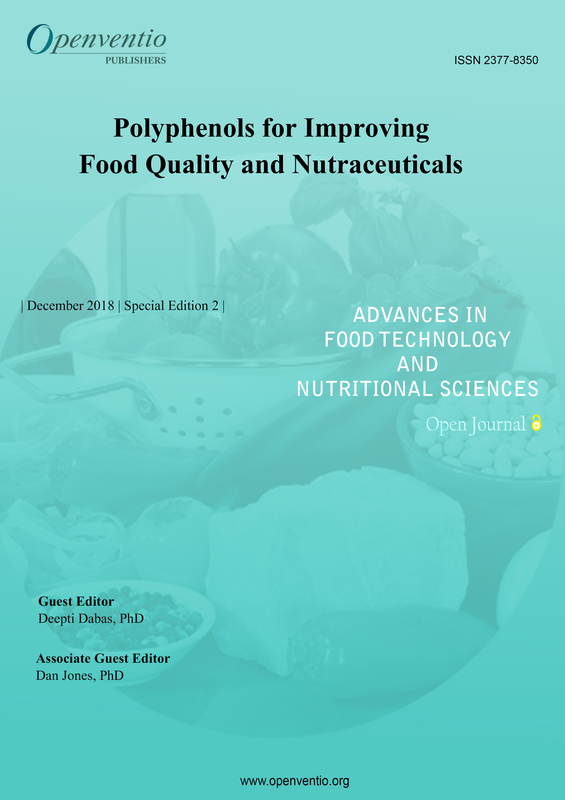 This review will introduce different types of PUFA oxidation, discuss its impact on food quality and human health and provide some thoughts for the future research directions. Comparison of Health Risks of Smoked Foods as Compared to Smoke Flavorings: Are Smoke Flavors “Healthier”? Is Garlic a Wonder Plant? 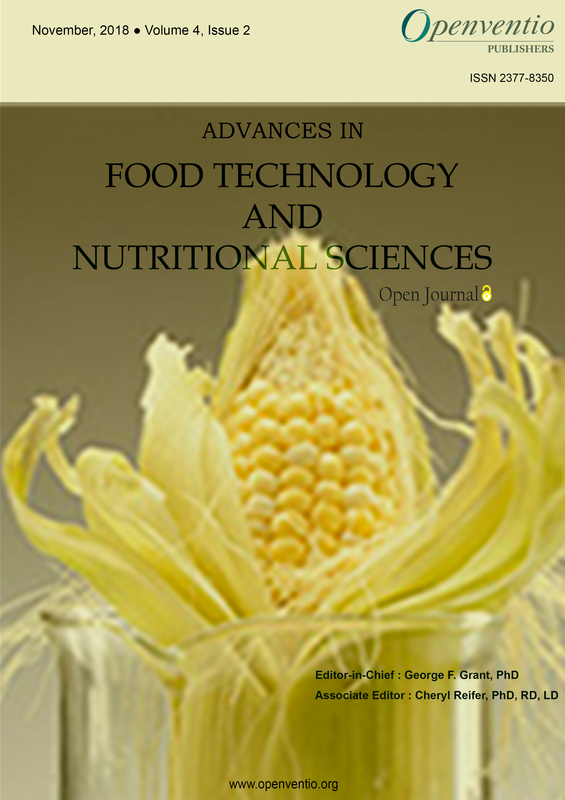 Advances in Food Technology and Nutritional Sciences – Open Journal (AFTNSOJ) strives to publish science-based information from the fields of nutrition and dietetics, in order to assist professionals in related fields to stay up-to-date on current advancements and relevant issues. “Food Technology” is a term describing food manufacturing and preservation processes; including physical, chemical, and microbiological operations in the handling, packaging, and distribution of food. Research and development in food technology essential to increase the rates of production and lengthen the shelf-life, without compromising the quality of the food or nutritional content. Due to the world’s growing population, the demand for food has been steadily increasing. Food technology will continue to play a major role in the future, to help production keep up with the demand for quality food. Large-scale production of safe and nutritious food is possible with research and development in food and nutrition. 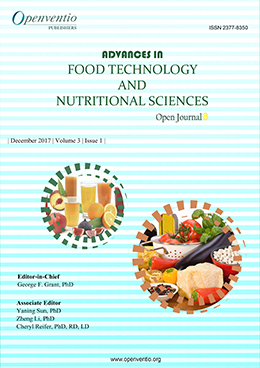 Advances in Food Technology and Nutritional Sciences – Open Journal (AFTNSOJ) is dedicated to the open dissemination of scientific information and robust discussion in all areas related to nutrition and food technology AFTNSOJ is openly available to a broad audience including physicians, nurses, engineers, microbiologists, dieticians, nutritionists, public health professionals, researchers, educators, and students. 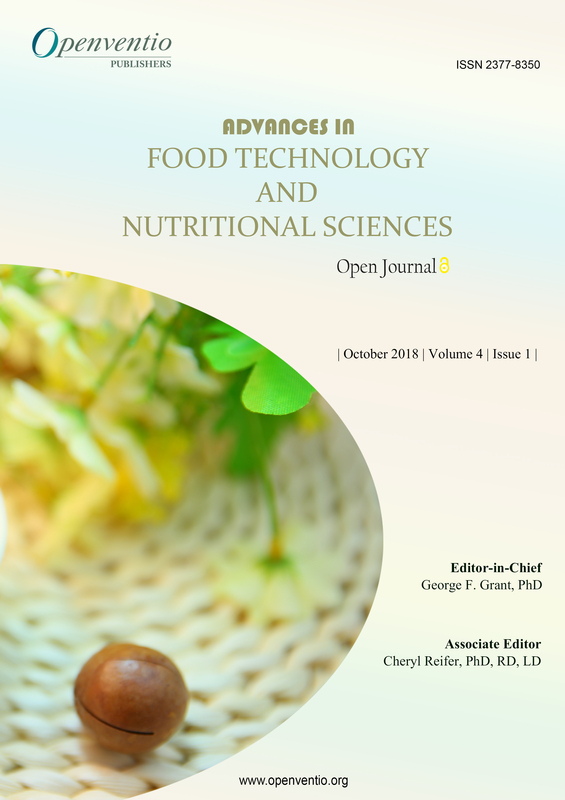 In addition to the science-based information on biotechnology in food science, AFTNSOJ also acknowledges the importance of political, social, and economic issues, quality control standards, social use of food as medicine in the form of neutraceuticals as well as the treatment of nutritional deficiencies. AFTNSOJ accepts a variety of submissions, and welcomes all types of articles such as: original clinical research and case-reports; literature reviews and mini-reviews; opinion pieces such as editorials, commentary, and book reviews, technical reports, conference materials, illustrations, etc. As we strive to improve the quality of our journal, any comments or suggested corrections from readers are welcomed. 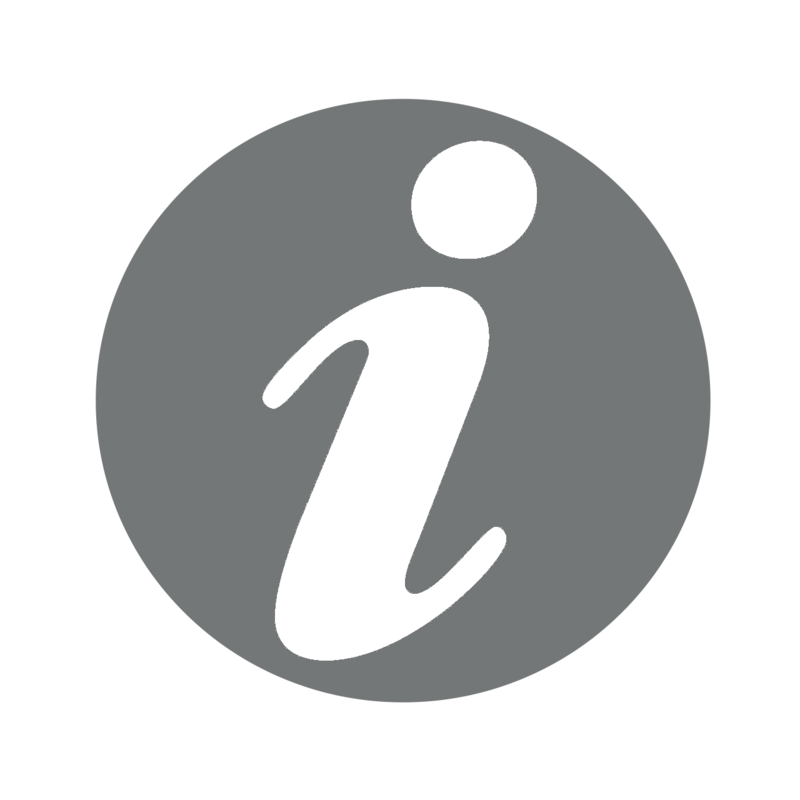 Please send us your thoughts using the “Contact Us” link.